New Delhi, April 28: With an aim to meet the immediate requirement of the security forces and to boost the indigenisation and in realisation of India's growing technological prowess, the Defence Ministry headed by the Raksha Mantri Nirmala Sitharaman accorded approval to the NAG Missile System and thirteen 127 mm calibre guns for the Navy valued at over Rs 3,687 crore. 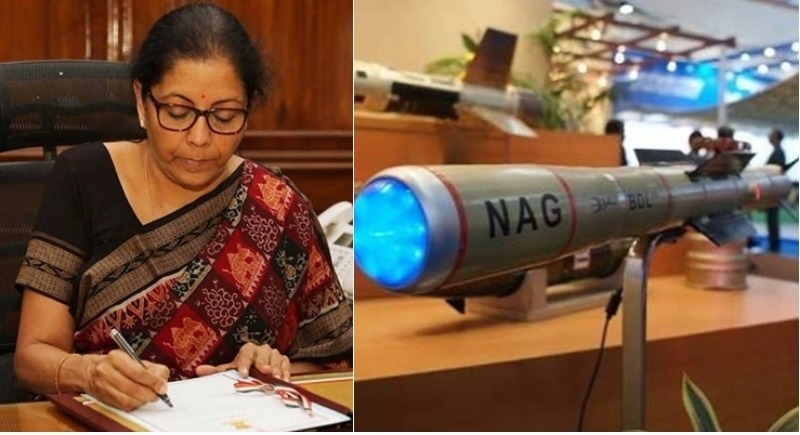 Notably, the DAC headed by Raksha Mantri Nirmala Sitharaman gave approval to DRDO’s designed and developed NAG Missile System (NAMIS) at the cost of Rs 524 crore. The system includes a third generation Anti-Tank Guided Missile, the NAG, along with the Missile Carrier Vehicle (NAMICA). The NAG missile is a third generation anti-tank guided missile, which has top attack capabilities that can effectively engage and destroy all known enemy tanks during day and night. This will give a quantum boost to the Army's capability against enemy armour. The DAC also approved procurement of thirteen 127 mm calibre guns for the Navy. These guns will be fitted on-board new construction ships for undertaking surface engagements including Naval Gunfire Support Operations. The guns will enable Naval ships to provide fire support and engagement of targets on the land. These guns have engagement range of 24 kilometres, which could be extended further by using Extended Range Gun Munitions (ERGM). These guns, a long outstanding requirement of the Navy would be procured from BAE Systems of the United States of America under the categorization of Buy (Global) at an approximate cost of over Rs 3,000 crore. The DAC also reviewed the progress of the DRDO programme to develop indigenous Airborne Warning and Control System (AWACS). In the month of February this year, the Defence Ministry cleared procurement of more than Rs 1800 crore to purchase an essential quantity of Infantry Combat Vehicle (BMPs-2/2k) for Mechanised Infantry and other arms.